China has launched its biggest rocket to date. 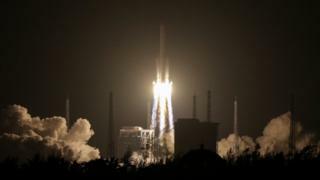 The Long March 5 lifted off from the Wenchang space centre in Hainan Province at 20:43 local time (12:43 GMT). It was carrying an experimental satellite, known as Shijian-17. The Long March 5 gives China the capability to orbit the heaviest of payloads - such as big telecoms spacecraft and sections of its future astronaut space station. The specifications suggest it can put about 25 tonnes in a low-Earth orbit (LEO), an altitude of a few hundred km; and up to 14 tonnes in a geostationary orbit some 36,000km above the planet. This puts the Long March 5 in the same class as America’s current, most powerful rocket - the Delta-IV Heavy. US companies SpaceX and Blue Origin are developing vehicles that should be able to put 50-plus tonnes in LEO. The American space agency (Nasa) is also nearing the first flight of its Space Launch System, a monster rocket that will eventually be capable of placing 130 tonnes in low-Earth orbit. Nasa say it will use this launcher to send astronauts to Mars. Its maiden flight is set for 2018.